The Dallas Cowboys just made DeMarcus Lawrence a very rich, happy young man signing him a huge long-term contract, and others will soon join him in the NFL’s multi-millionaire club. So who’s in line to rake in the NFL’s next mega-deal? These stars are all looking at long-term contract extensions worth big money in their near future. Set to become an unrestricted free agent in 2020, Green could potentially opt not to re-sign with Cincinnati. He’s never won a playoff game in his NFL career, and it’s not hard to imagine how much more dominant he might be in an offense that features a true top-flight talent at the quarterback position. However, Green appears to be all-in on his team. Recent reports indicate the Bengals plan on extending the contract of this 30-year-old superstar. A player who has caught 63 touchdowns in eight seasons, he’ll land a big deal regardless of which franchise he signs with. The Seahawks weren’t about to let Clark hit the open market this spring and used the franchise tag to secure him. It pays just over $17 million, yet both sides want to get a long-term deal done before the tag becomes a lingering issue. When whispers of a potential holdout cropped up in March, head coach Pete Carroll said he expects a deal to get done. A dominant edge rusher who has piled up 32 sacks the past three years, he’s set to land a major haul. There is no guesswork involved here. Prescott is going to get a huge contract extension with the Cowboys. Jerry Jones has made that crystal clear. Dallas feels it has seen enough out of the former fourth-round pick to completely invest into him as the franchise quarterback. We have some serious doubts that he’ll end up being worth it in the long run. But when it’s all said and done, Prescott will likely sign a deal that pays him at least $28 million per year, with significant guarantees in the first few years. Clowney must be quite happy to see what kind of cash the Cowboys gave DeMarcus Lawrence, because that’s likely to be a figure his representatives will ensure they exceed. Houston has wanted to sign Clowney long term, but the two sides haven’t been able to hammer out a deal yet. Now on the franchise tag, Clowney will either sign an extension before the June 15 deadline, or he’ll play out the season making $16 million guaranteed while he watches his price tag rise even more in 2020. Dallas paid a pretty penny in draft currency to bring Cooper on board last year. Now it’s time to keep him happy with a long-term extension that won’t be cheap. This former first-round pick has shown big-play abilities in his first four seasons, catching 25 touchdowns while averaging 14.1 yards per reception. He and Prescott had good chemistry last season, too. 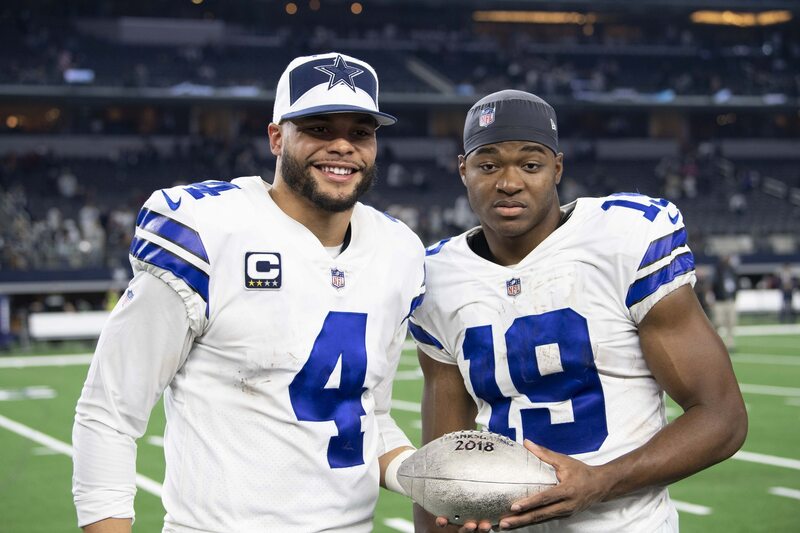 So you know Jerry Jones and Co. will be itching to secure this duo for the foreseeable future. One of the best young 4-3 defensive tackles in the game today, Jarrett has been getting better by leaps and bounds every year since being selected in the fifth round of the 2015 NFL Draft. He would have made a killing on the open market if Atlanta hadn’t used the franchise tag to secure him this offseason. If he remains on the tag, Jarrett will make $15.2 million guaranteed this year. If he and the Falcons work out a long-term deal, the guaranteed money he’ll receive should triple, at least. Though not as explosive as some of the big-play receivers in the league, you could make an argument that Thomas is the best all-around receiver in the NFL today. All he’s done the past three seasons is haul in 321 passes on of 417 targets (that’s an absurd 77% catch rate, folks) for 3,787 yards and 23 touchdowns. He’s set to make just $1.6 million this season during the final year of his rookie deal. The Saints will not let him hit free agency, so expect Thomas to reel in a huge contract sooner rather than later. One of the best all-around defensive linemen in the league, this 25-year-old is a rare player who can thrive in any scheme. Buckner can also dominate inside and out on the edge. He broke out in a big way last year for the 49ers, racking up 12 sacks. Entering the fourth year of his rookie deal, Buckner will make just $5.78 million this season. There is a chance he could potentially be secured for another year with the fifth-year option. Yet San Francisco would be smart to just sign him to a long-term deal and get it over with before he gets even more expensive. Of all the players we’ve listed, nobody will come close to matching what Wilson will haul in on a long-term deal with Seattle. He has reportedly set a deadline of April 15 to get a deal done, and one report suggests he’ll pull out of negotiations if the Seahawks don’t do a deal with him by then. Whether he gets paid now, or if he ends up playing contract chicken with the team next year, Wilson is going to set a new NFL record for most money per year, and most fully-guaranteed cash.